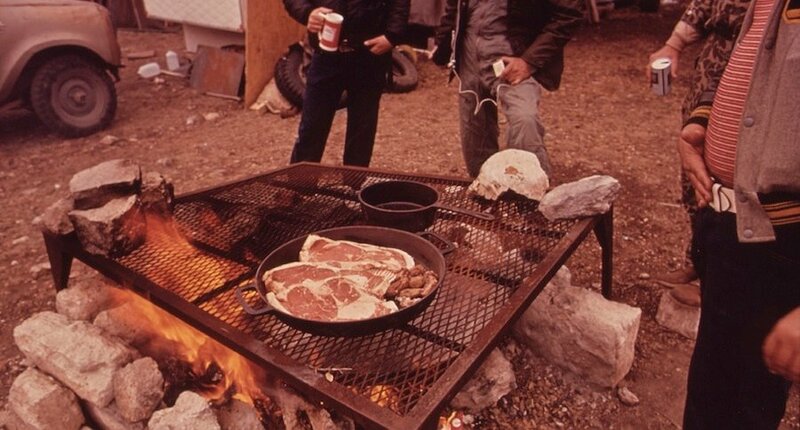 Here are ten of our favorite hunting camp meals. See if your favorite made the list. If you've ever been hunting, you know one of the highlights of every trip is the food. Nothing compares to breakfast over a fire at deer camp on a brisk fall morning. No dinner is as good as one with wild game over a fire, old hunting stories and a few cold ones. But which meal is the best of the best? Lucky for you, we decided to make a list. What would make your top ten? Didn't your mother ever tell you that breakfast is the most important meal of the day? Fill your belly with a good breakfast and avoid running back to camp to feed those mid-morning munchies. Wake up early and cook and you'll enjoy rock star status with fellow campmates. Okay, maybe bacon could have been included in the breakfast section, but when preparing meals for hunting camp, bacon is so much more than a breakfast food. Eat it straight, make a BLT for lunch, or wrap blue cheese stuffed backstraps in it. However you choose to use it, make sure you take plenty of bacon to hunting camp. A hunter's lunch of champions. If you've eaten a proper hunting camp breakfast, you should be full until at least 2:00 P.M. If you are trying to eat healthy or think you are developing scurvy from your hunting camp diet, substitute an apple for the candy bars. A light lunch like this will ensure that you are starving when it comes time for dinner, the main event. This simple meal is the sign that you, or someone in your hunting camp, has had a successful hunt. Grill the backstraps to medium-rare with your favorite seasoning, bake or fry the potatoes, and enjoy the culinary spoils of the hunt. "I made em' extra sloppy for ya. I know how you hunters like em' sloppy." Fill a crockpot with whatever wild game meat you have on hand, potatoes, onions, celery, corn, tomatoes, a can of beer, a little water, salt, pepper, and whatever else is in the refrigerator or spice rack and turn it on low. When you return from hunting you will have a delicious stew to eat before processing whatever you just killed. Cut up venison and vegetables, skewer with a stick, and apply heat. It's so easy a cave man could do it. Bake the "wings" at 350 until they are cooked through, then give the pieces another coating of wing sauce and enjoy. Don't be surprised if this one becomes a turkey camp tradition. There comes a time when it happens to every hunting camp -- the dreaded skunking. Camp members are left sitting around with bruised egos, wildly exaggerated excuses, and growling bellies. It pays to prepare for the day when no one brings home the meat and bring some from the store. Pulled pork sandwiches are tasty enough to get even the most dejected hunter's spirits back up and have him looking forward to the next day's (or the next year's) hunt.